St Loman’s got their season underway with a win in Tyrrellspass last Saturday evening. On a day where conditions were difficult to say the least, The Blues elected to play against the gale force wind in the First Half. TJ Cox got the Saints off the mark straight away with a well taken score. The Hosts equalized almost immediately. The Opening Half was a tight affair but Tyrrellspass caught the Blues defense off guard and struck with an early goal. Paul Whelehan, making his competitive debut for Loman’s opened his account with a free. The last ten minutes of the first half was a period of dominance for Tyrrellspass as they clocked up four scores without reply. Three of which came within two minutes of each other. The Blues trailed by six points at the interval but crucially had the wind in the Second Half. St Loman’s clawed their way back into the game after the Break. David Whelan’s long range score set the tone for a strong Second Half display. The Blues reduced the arrears to four points with TJ Cox adding to his tally with another excellent point. New Man Paul Whelehan then hit three impressive quick-fire points to put the Saints within a single point of their counterparts. The Crucial score of the game came from Chris Gilbert after a lung-bursting run and an excellent finish off both posts and into the Tyrrellspass net. The Hosts got a score back from a placed ball but this was to be their only score of the Second Half. Paul Whelehan again added to his impressive debut with an excellent point to extend the lead, before the point of the match from the inspirational Paddy Dowdall. Dowdall’s long range score was to be a fitting end to the game and secured the two points for St Loman’s. There were some terrific displays in this three point win such as Paul Whelehan and TJ Cox in the forwards. Paddy Dowdall was reliable as usual but Man of the Match must go to Kelvin Reilly who led by example on the day and controlled the game from centre-half back. A great win for the Blues and hopefully the first of many. Team; Dano Fitzsimons, Conor O’Donoghue , Darragh O’Keefe, Tristan Graham, Paddy Dowdall (0.01), Kelvin Reilly, Sean Lancaster, Stephen Gallagher, Sean Flanagan, Sam McCartan, David Windsor, Chris Gilbert(1.00), TJ Cox (0.02), Paul Whelehan (0.05), David Whelan (0.01). Subs used; Jack Tyrrell, Paddy Lynam, Fola Ayorinde. St. Loman’s players and management were left somewhat disappointed in this opening Division 5 game of 2019, after leaving a bitterly cold and wet Downs GAA grounds pointless. St. Loman’s started sprightly, however they had registered 3 wides before Conor O’Donoghue opened the scoring on 10 minutes with a superb point from play. This was followed up with another good point from the impressive Darragh O’Keefe after a quickly taken free from Enda Gaffney. It was around this time that The Downs upped the ante, but they couldn’t break down the Blues defence which remained solid thanks to full-back Adam Carroll and centre back Senan Russell, who were ably flanked by Cleary, O’Donoghue, Johnson & Hogan. With weather conditions deteriorating further, some basic errors eventually lead to the concession of some soft frees which were duly converted by the Downs, leaving them ahead by 5 point to 2 coming up to the halfway mark.St Loman’s can count themselves lucky not to be further behind thanks to a magnificent save from James McKenna. It was at this point that Stephen Sheridan was introduced as a substitute and Sheridan immediately made an impact by winning a free which saw James Cox slot over between the posts, to leave the Blues trailing by 2 points at half time, on a score-line 0-5 to 0-3. For the 2nd half St. Loman’s introduced Cian Cleary and Josh Murphy, both of who were making their debuts in adult football, and both players acquitted themselves very well indeed. Unfortunately, Loman’s were guilty of some wayward shooting up front and with less than 5 minutes left they found themselves 0-8 to 0-3 down. 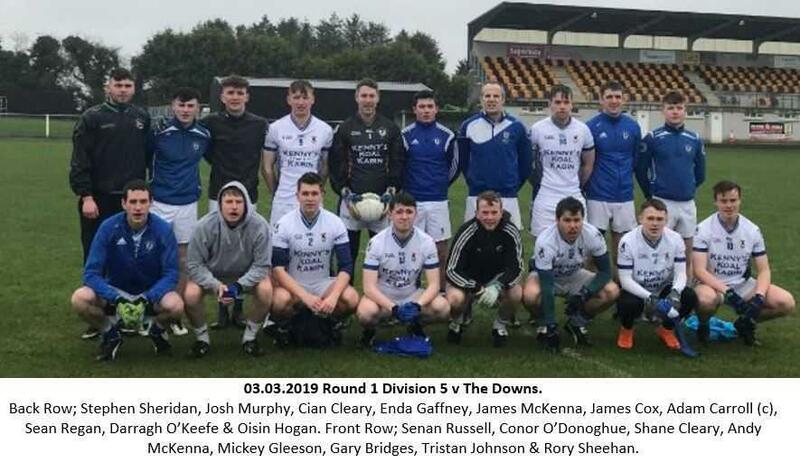 Rory Sheehan, Mickey Gleeson and Gary Bridges were all causing problems for the Downs rear-guard however it was left to James Cox to keep the scoreboard ticking over with 2 more pointed frees. In the dying minutes of the game it looked like the Blues had a garnered a penalty, but alas the referee waved play on. Loman’s still had a chance to salvage a draw with the last kick of the game however this excellent goal chance was spurned, and the Downs held on to win on a score line of 0-8 to 0-5. Next weekend will see St. Loman’s welcome St. Josephs to Lakepoint Park for Round Two of the league. Team. James McKenna, Shane Cleary, Adam Carroll (c), Tristan Johnson, Conor O’Donoghue (0-1), Senan Russell, Oisin Hogan, Darragh O’Keefe (0-1), Enda Gaffney, Rory Sheehan, Mickey Gleeson, Gary Bridges, James Cox (0-3), Sean Regan & Andy McKenna. Subs used; Stephen Sheridan, Cian Cleary & Josh Murphy. The Night is nearly upon us folks we have less than a week to go! If you haven’t got your ticket yet they are available in Eason’s, Sherry FitzGerald Davitt and Davitt, Martins Quick Pick and Kenny’s Koal Kabin. Alternatively contact any committee member or actor , don’t miss out folks these are the best set of films we’ve done in the last three years and it promises to be a night to remember. We hope to see you all next Saturday 9th of March! Thanks to all who turned out in Kerrigan’s last Friday night for our table quiz fundraiser it was a huge success, thanks to Alan Bracken for organising the event. We are hosting a merchandise day courtesy of KC Sports on Saturday 13th of April. Contact Paul Dempsey for orders (085) (803 0067).